Mobile apps are increasing in popularity among Chinese users, not only for business, but also in their daily lives. According to the China Internet Network Information Center, China had a staggering 753 million mobile internet users at the end of 2017. 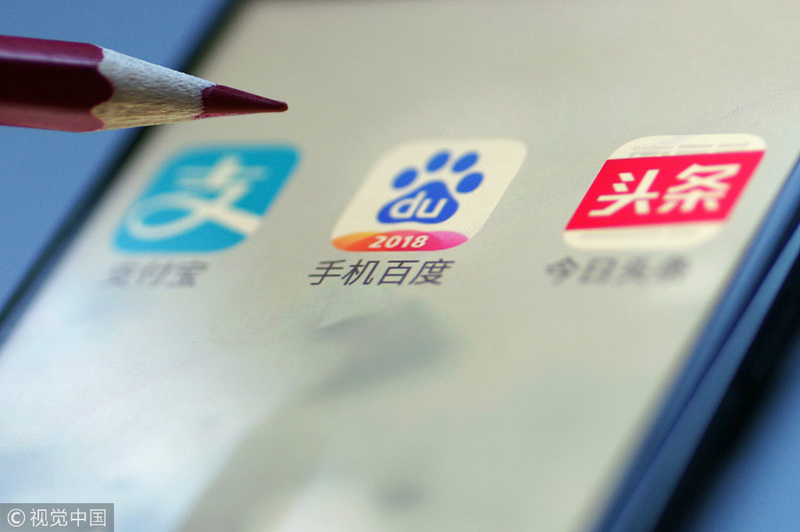 Industry analysts said that the popularity of apps also reflects the accelerated proliferation of mobile devices in China, transforming the country into an app-driven society. According to a recent survey by China Youth Daily, more than 40 percent of people surveyed discussed the World Cup in Russia on social networking apps with their friends. Among those surveyed, 66.8 percent watched live broadcasts on mobile apps or TVs and 61 percent made predictions about games online. "The increasing use of apps to watch the games was a distinctive feature of the 2018 World Cup compared with the previous one," said Zhang Baoyi, director of the sociology institute at Tianjin Academy of Social Sciences. Mobile internet users accounted for more than 97.5 percent of the total number of internet users last year, up from 95.1 percent the previous year. "Growth of China's app economy is accelerating, putting it within striking distance of economies like Japan and the United States, said Bertrand Schmitt, CEO and co-founder of App Annie, a mobile analytics institute. According to the institute, the country's app economy has outpaced the majority of markets globally, be it the overall time spent using apps, the number of apps used or the amount of money spent on them. It noted that in the fourth quarter of 2017 alone, Chinese app users spent roughly 225 billion hours using apps, which is 4.5 times longer than in India, the next largest market, which clocked close to 50 billion hours in 2017. "The market scale is expanding continuously. People tend to spend more for app services," he added. The report showed that Chinese consumer spending through Google Play, the iOS App Store, and third-party Android stores jumped 270 percent to roughly $33 million over the past two years. Cheetah Global Lab, a mobile internet research institute based in Beijing, released a list of the top 10 app categories in 2017 based on growth of the weekly active penetration rate (the number of users who logged on at least once a week). Racing ahead are bike-sharing, online food delivery, short video and mobile payment apps. Use of short video apps, for example, is rocketing in China. Beijing-based consultancy Analysys found that Chinese users spend 49 minutes every day watching either professionally produced videos or amusing home-made videos via short video app Douyin alone. "It is apparent that there is a strong social aspect to short video apps. They present a new medium for online expression and interaction," said Ma Shicong, an entertainment analyst at Analysys. While global smartphone users have an average of 80 apps on their phone, Chinese users have more than 100 apps stored on their handsets. QuestMobile, a Beijing-based market research firm, found that youngsters are the main group trying new apps. Among these users, people born in the 1990s and 2000s use an average of 21.9 apps and 20.5 apps respectively, while others only have 17 apps. In terms of future trends, Quan Jing, executive director of Cheetah Global Lab, said that competition in the ride-hailing sector will intensify, as epitomized by Meituan, the country's largest on-demand service platform, which has announced plans to launch a ride-hailing app. "Key words in this increased competition will be 'sharing' and 'new energy'," Quan added. App Annie predicted that China will remain the world's largest mobile app market and the market share for music, social networking and other types of apps will grow in the coming years.